Savor the flavor of eating light! I eat all things in moderation, but I do try to make chicken or fish the majority of the week. This keeps me eating leaner meats for my proteins. What I commonly hear from others is that these happen to be the two options that become the most boring. To me though, they are the most versatile! I am a sucker for a seared tuna steak or a juicy foil pack salmon, but a lot of times I will go for just a white fish. I will admit that tilapia is not one of my favorites, so when I saw a beautiful slab of a filet called turbot I was intrigued. I had never heard of this fish before and decided to give it a try. Let me just say it is now a new obsession whenever I can find it! 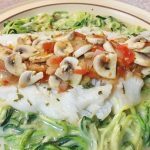 This lemon butter sauteed fish and zoodles is so creamy you won’t even realize how light and #healthy it is! I chose to sauté my turbot filet in a homemade lemon and butter sauce with some mushrooms, onions and tomatoes. All you need to do is melt some butter in a saucepan over medium high heat and sauté some minced garlic and diced onions. Throw in the sliced mushrooms and chopped tomatoes. Push these to the side and add in the fish. I sprinkled everything with some parsley, a little pepper and a white wine and garlic butter seasoning. The mix I use is this one, although you can thicken the sauce with a little flour and add some real white wine in for the flavor. While the tomatoes cook they add to the juices too. I also kept the top of the pan on to hold all the moisture in. A cutting board like this with a built in tray makes it much easier to transfer all of your cut up produce to your cooking area! No mess at all! During this time you can take the zucchini and spiralize it to create zoodles! Depending on the size of your pan you can add these in or cook separately. I chose to use a zucchini to make my noodles because it adds in another serving of greens and is a much healthier option when you want to keep it light. 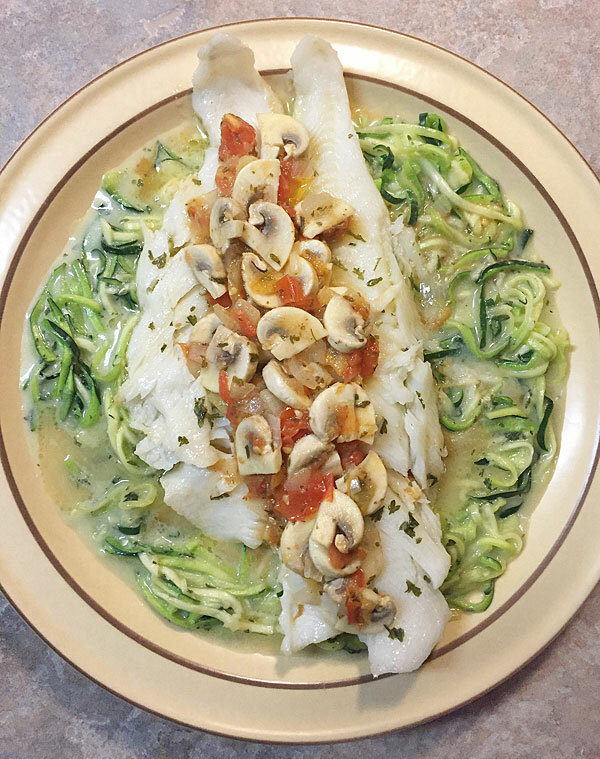 Once ready serve the sautéed turbot over the bed of zoodles with the rest of the creamy sauce! I topped off my fish with the veggies, and then pretty much devoured everything! This moist fish couldn’t have turned out more perfect! The recipe may be simple, but the taste is powerfully delicious! Turbot with sautéed mushrooms and tomatoes in a lemon butter sauce over a bed of zoodles. Melt some butter in a saucepan over medium high heat and sauté the garlic and onions. Throw in the mushrooms and tomatoes. Push these to the side and add in the fish. Spiralize the zucchini and add in to the pan. Sprinkle everything with some parsley, a little pepper and a white wine and garlic butter seasoning. 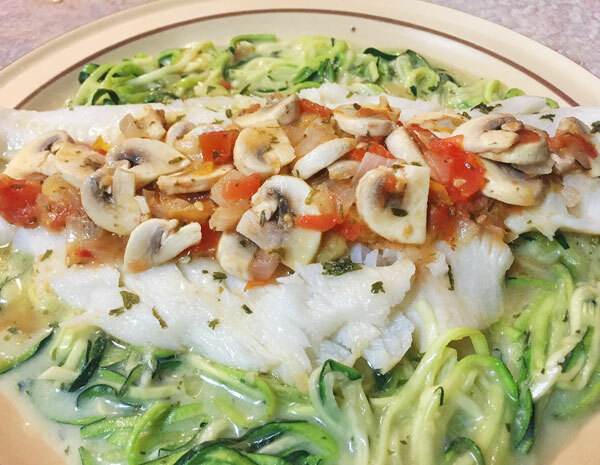 Once ready serve over the bed of zoodles with the rest of the creamy sauce and top the fish with the veggies! Slice the mushrooms, chop the tomatoes, dice the onions and mince the garlic. You can sub the white wine seasoning mix for a dash of white wine and tablespoon of flour instead to thicken the sauce and add some flavor. 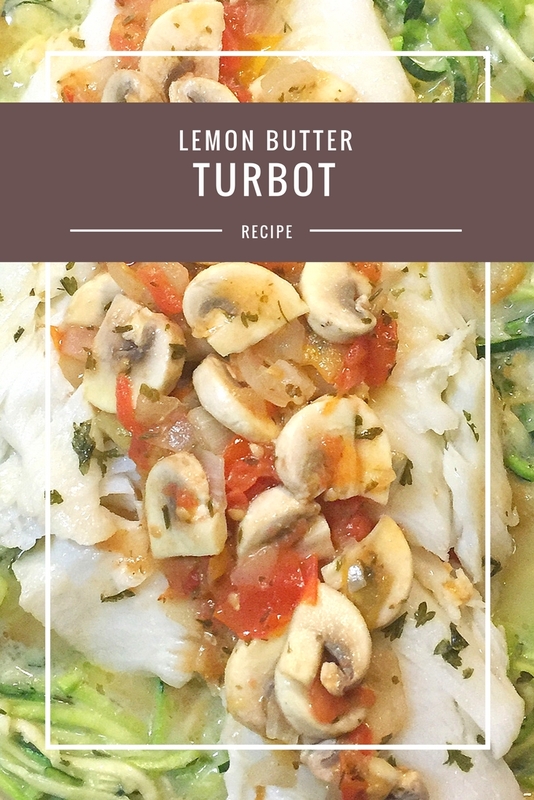 This sautéed turbot turned out so light and tender- just absolutely scrumptious! Cooking the fish in the buttery citrus juice was an excellent choice. It will be difficult for me to try this any other way after such a satisfactory first bite! This is a Paleo approved recipe, and of course gluten free too! I thought I would have such a hard time when I originally decided to cut back on wheat but turns out I really love all the pasta substitutes! Vegetable noodles are such a win! So glad I stumbled across this post!! I have been looking for some different recipes with zoodles and I am happy to see this one has fish too! Most that I have made so far are cold… Thanks so much for sharing! You have a lot of good looking stuff I need to PIN for later!! !